Given the nature of the Soviets’ harsh restrictions on firearm ownership by the general public and Mr. Sivitski’s condition, he did not have much opportunity to enjoy the shooting sports that he dreamed of, or even to go to a library to learn more about the subject that he loved. For years, a meager selection of a few books and magazines were his only source of information on the topic, so he read and re-read them over and over. And then… the internet came. With this nearly limitless supply of information and knowledge now available to him via the internet through the use of assistive technologies, Yuri described himself as a “dimensionless sponge” to soak up information. He was finally able to pursue knowledge about his passion, even if he was not able to put it into practice on the firing line. As many good stories tend to be, Yuri Sivitski’s story is also a love story. A little over a decade ago, he met Nataliya, who he describes as “an amazing woman, brave and crazy enough to become my wife.” In 2006, Yuri moved to the United States and now lives in Ohio, where he works part-time in the technology field and can not only continue to pursue his passion for firearms knowledge, but also the American Dream. In 2010, Yuri took the next step by becoming a United States Citizen. Despite their love, however, Nataliya did not initially share Yuri’s interest in firearms. In fact, she was strongly opposed to private firearm ownership, believing them to be dangerous and frightening. 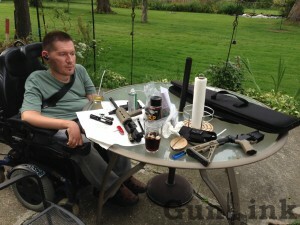 Over time, by sharing his knowledge and meeting other gun owners, Nataliya saw that firearms need not be frightening and that American gun owners are not violent criminals or madmen but, rather – as many in the firearms community have come to recognize – are often some of the most friendly, helpful, and respectable people. Thanks in large part to Yuri’s efforts, she has since become much more comfortable with firearms and is now an avid Second Amendment supporter with an active interest in the shooting sports – something that he is quite proud of. Yuri is interested in a variety of shooting sports and firearm types and enjoys going to the range with his wife and friends, even if he cannot actively participate. While plinking and target practice are fun, his real passion and goal is to get out in the field and go hunting. Believe me, it’s not an easy matter – teaching somebody to do something you have never done yourself. I am enjoying it a lot, but it hurts to think all the time that you never will be able to do what you want more than anything else: To go to the range with friends and shoot targets together – not just watch them shooting. To go hunting – not just watch YouTube videos and read hunters’ stories. BeAdaptive was started by fabricator and welder Brian Kyler after he met a quadriplegic man named Eric who had suffered C3/4 spinal injuries yet maintained his dream of being able to shoot firearms. To help Eric fulfill that dream, Brian was able to develop and build the first BeAdaptive shooting device. From those beginnings, BeAdaptive has grown to have a wider line of assistive shooting devices, according to their website, “whether you just need help pulling the trigger or if you are a high quad with no hand or arm movement.” If it could help Eric pursue his passion, perhaps it could help Yuri do the same. 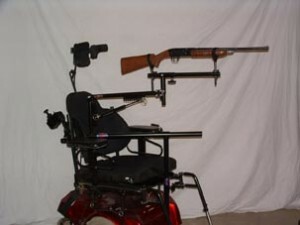 These devices can mount to wheelchairs and allow shooters to manipulate firearm controls with a light touch or even just a breath. Yuri’s dreams now seem within reach, with only one last hurdle between him and the shooting range: the cost of the devices. With modest means, a tight budget, and the support of family and friends, Yuri has reluctantly started a GoFundMe campaign through which others can make donations to help offset the cost of the equipment he would need to be able to actively get out and participate in shooting sports. Through his quest for knowledge, even before he came to the US Yuri had also familiarized himself with the United States Constitution, including the Right to Keep and Bear Arms as protected by the Second Amendment. Once here, however, he was – as many natural-born Americans continue to be – somewhat surprised and bewildered by the patchwork of gun laws throughout the states rather than a true, nationwide protection of gun rights. We wish Yuri and his newly pro-Second Amendment wife the best of luck in pursuing his dreams of participating in the hobby that many of us take for granted. 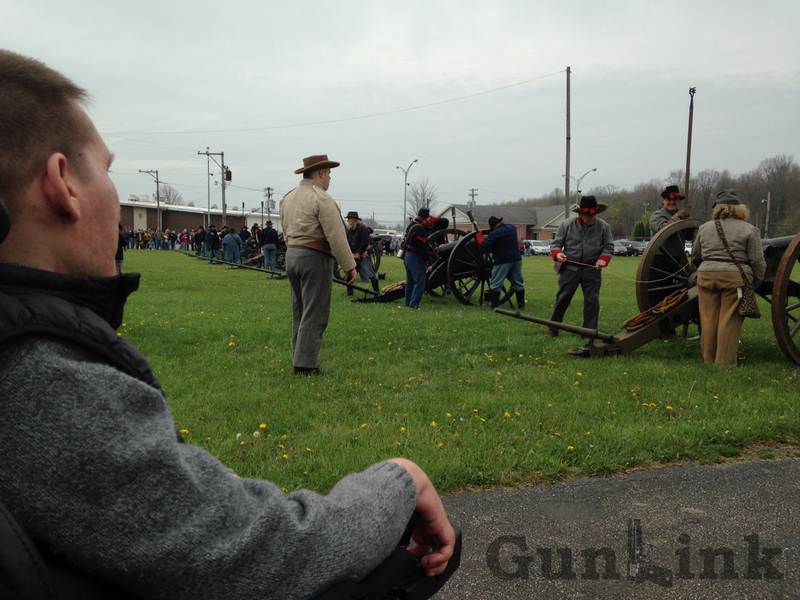 Be sure to stop by Yuri’s thread on the GunLink Forums to share your words of encouragement and stories of overcoming obstacles to participating in shooting sports and ask questions. We anxiously await sharing a follow-up article with our readers about Yuri’s participation in shooting activities. Stay tuned to the GunLink Blog and Forums!